Since the early days of In-Place Hold, the number floating around (and documented) is a maximum of five In-Place Holds before Exchange holds all content, but it’s incorrect. See the Updates section at the bottom of this article for the latest. Query-based hold: In-Place Hold allows you to specify query parameters and place a hold on items that match the query. Multiple holds: You can place a mailbox (user) on multiple In-Place Holds, often a requirement to manage holds for different cases or investigations. 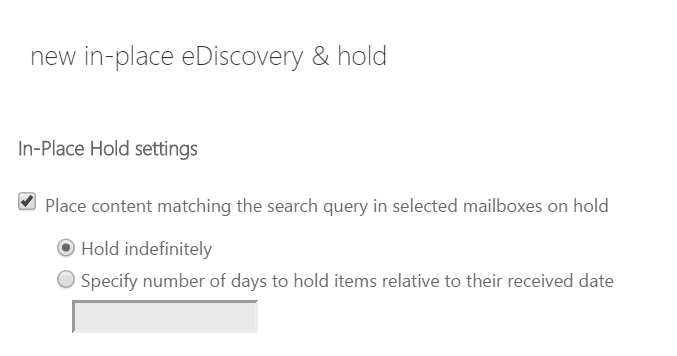 One of the limits I listed in eDiscovery Limits and Throttling Policies in Exchange Server and Office 365 is the maximum number of In-Place Holds you can place on a mailbox. You can find the Office 365/Exchange Online eDiscovery limits in Search limits for In-Place eDiscovery in Exchange Online. When processing items to permanently delete them from a mailbox, the Email Lifecycle Assistant (aka the Managed Folder Assistant or MFA – you may have seen some old error messages refer to it as ELC assistant) must evaluate each item against the query parameters in each In-Place Hold. If a user is placed on more than a few In-Place Holds, it becomes resource-intensive to evaluate each item against the query parameters in each hold. Since the early days of In-Place Hold, it’s been documented as five In-Place Holds. After some testing and digging, I can confirm it’s incorrect and the documentation is being updated. As documented, the evaluation isn’t sequential. It happens in parallel by using the OR operator to combine multiple queries. For example, if one query is (patent AND filing) and another one is (Tailspin OR Contoso), the two queries are combined for evaluation purposes so the actual evaluation done is (patent AND filing) OR (Tailspin OR Contoso), and so on for each additional In-Place Hold. The operators (AND, OR, NOT, etc.) are not considered keywords. The actual limit for In-Place Holds before they’re treated as Litigation Hold (all content is on hold) is a maximum of 500 keywords in all queries combined. Thanks for the great and timely clarification, Bharat!